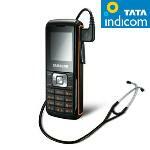 Tata Teleservices Limited today announced “Doctor on Call” service in partnership with Rx Healthcare Magic Pvt. Ltd. This service provides assistance under any medical emergency situations and also provides medical consultations. The calls for consultation are chargeable at Rs. 9 per minute. To avail Tata Indicom – Doctor on Call service, subscribers need to dial 54887, and a doctor registers the personal data and medical history of the subscriber. The attending Doctor diagnoses the cases whether they feel that the subscribers’ case falls under the given three options- Acute/ Chronic/ Emergency. If it is an acute condition, the caller will be given three different diagnoses by the attending doctor who will also suggest some home remedy to the caller for immediate relief.